Because we don’t like traffic and hunting for parking, Date Night rarely ventures into Buckhead. 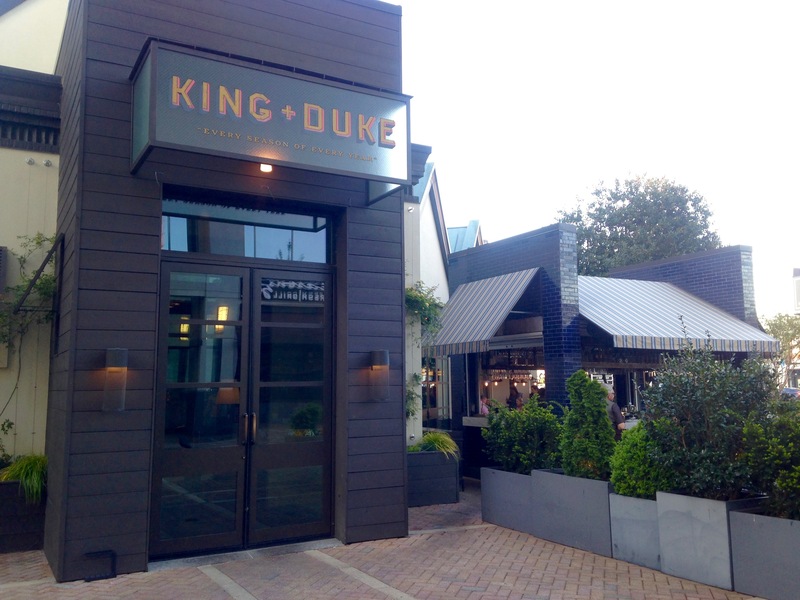 Tonight, we brave the wilds of Buckhead to celebrate our solo-offspring’s birthday as we become perhaps the last Atlanta food bloggers to visit the King+Duke. The King is a creation of Ford Fry, the chef/enterpreneur behind The Optimist, which lands on many top-ten lists. 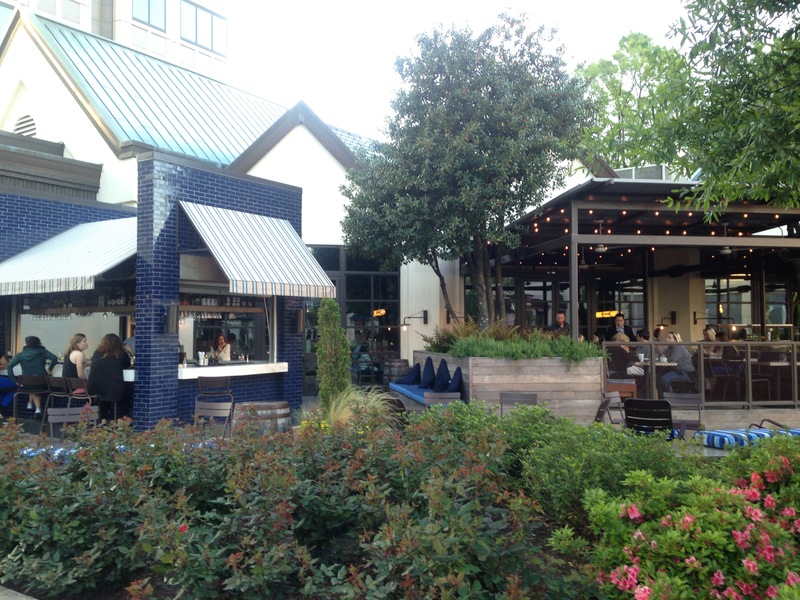 It’s located next to two very tall high-rise buildings that are right in the thick of things in Buckhead. First tip: use the valet parking. They will validate it and it will just cost you to tip your car parker. There’s a large bar when you walk in. We hear the “cocktail program” is supervised by expert “mixologists”. Translation: the bartenders know how to mix a drink. 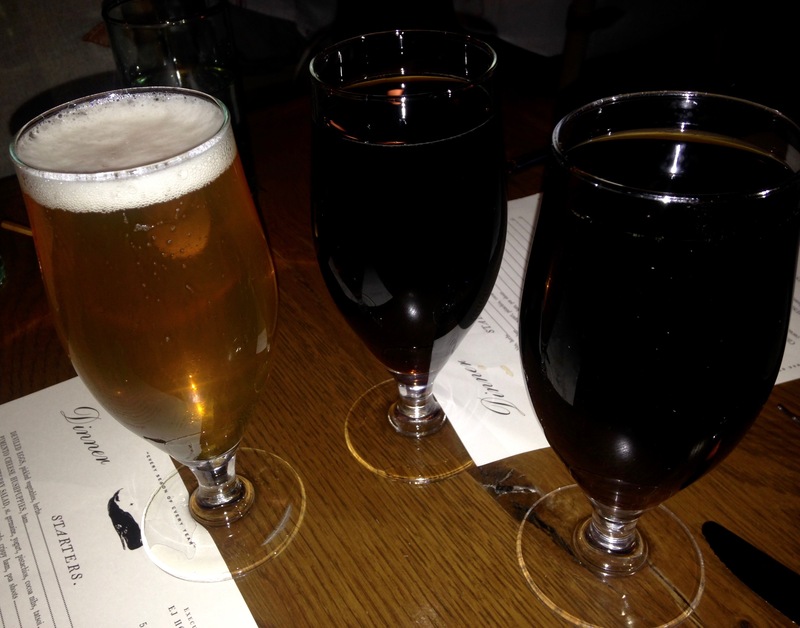 We are much simpler folk and order three beers. The dark beers are Cigar City Maduro Browns. Very tasty from Tampa. Elliott likes IPAs and goes hoppy with a Three Taverns Night on Ponce. While we are waiting for the beers, these guys arrive. 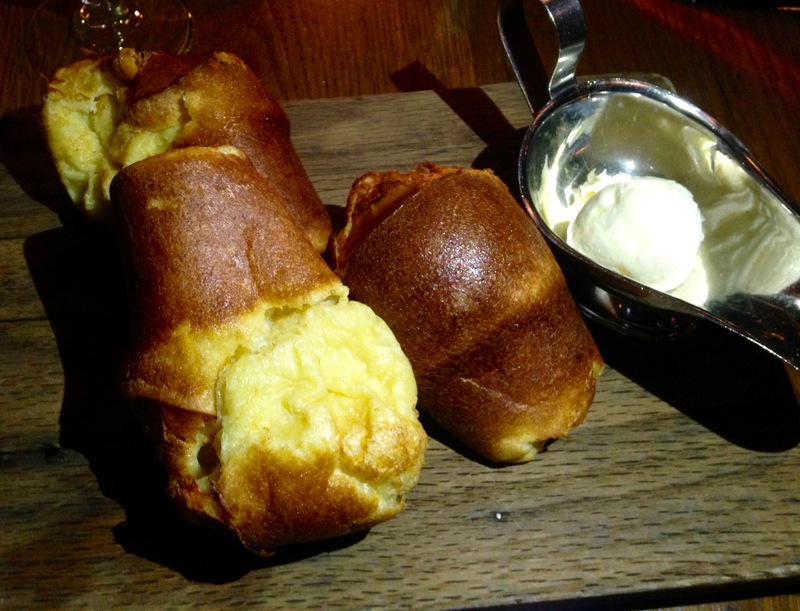 The hot popovers come steaming from the oven. Throw some butter on them and you have “bread basket nirvana”. I could just eat these and go home happy, but there is more to try. 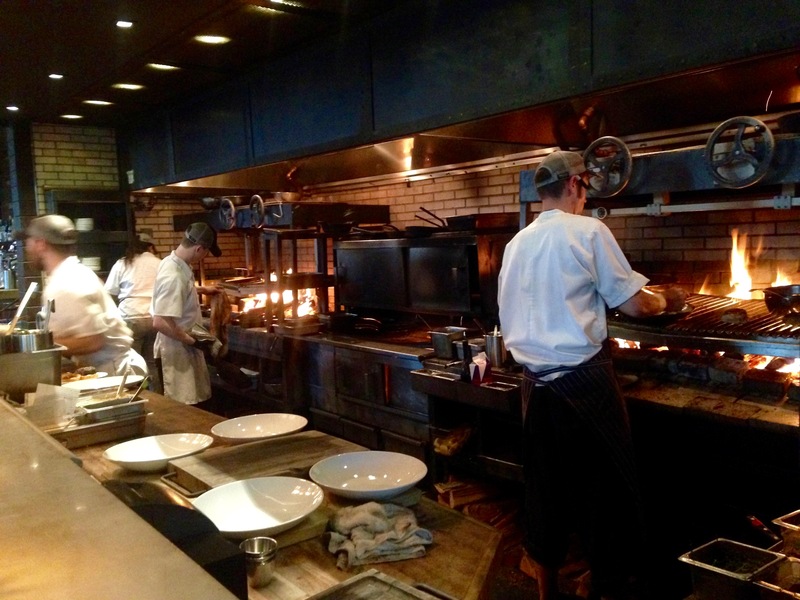 The star of the restaurant is the huge hearth that dominates the dining room. We are seated near it, so we get dinner and a show. As we shall soon find out, these guys are cooking some great things on that fire. Don’t tell anyone, but our first dish comes from the fryer. 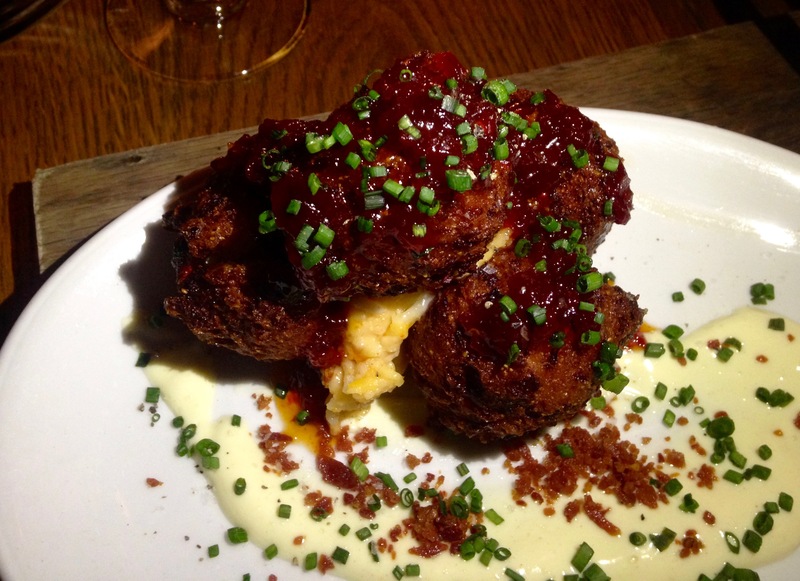 The pimento cheese hushpuppies have a little kick from the sweet pepper jelly that is drizzled on top. The cheese goes perfectly with the fried balls of corn meal. This is a fun twist on a southern staple. The menu has a lot of meat, because that’s what you cook over fire. What can we get from the monster hearth? “The King” is a 2.2 pound hunk of prime ribeye ($87), which you can share with a couple of friends. We didn’t see one come out, but the whole Springer Mountain chicken looks gorgeous. 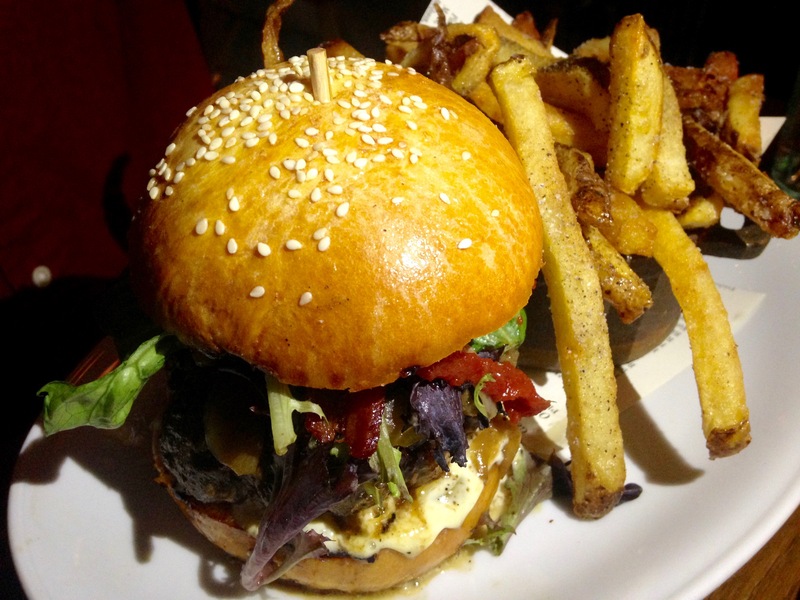 The birthday boy goes for “The Duke”, the house burger. He really enjoys it. For the purpose of reporting, I steal a few fries. They have a nice seasoning and I swipe a few more. As we know, if there is trout on the menu, Eve is going to order it. It arrives with peas and “torn” potatoes. Evidently someone in the kitchen is the vice president in charge of potato tearing. 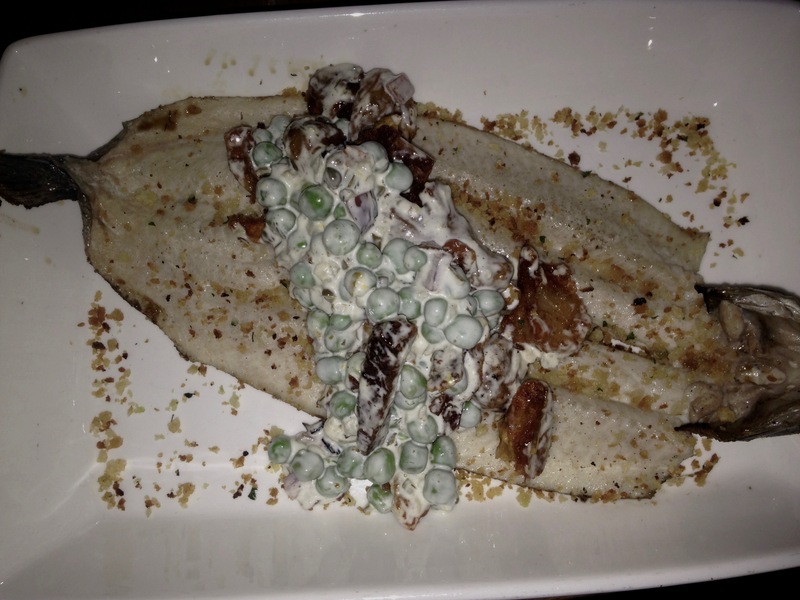 This fish is the reason she orders trout. It’s not too wet or dry—it’s just right. It’s dusted with pecans, which give it a nice texture. Eve is not a pea fan, but she likes these crispy green orbs. Our final entree is the “fish of the moment”. 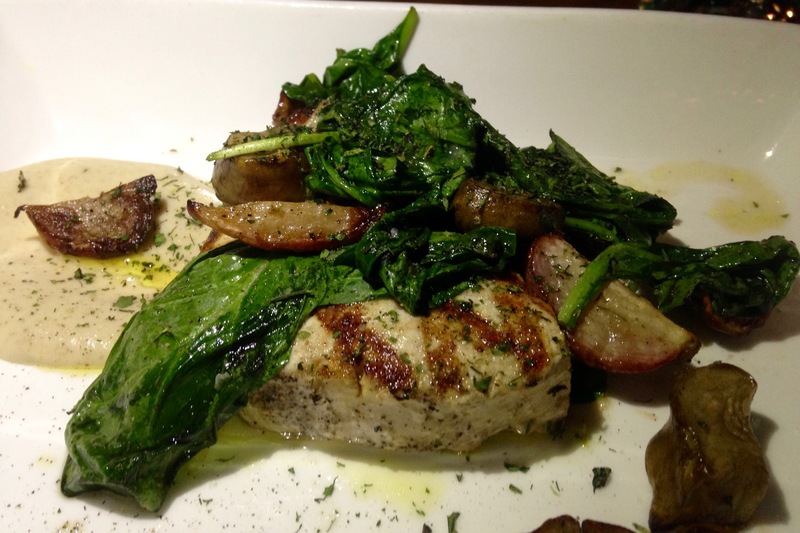 Tonight, it’s swordfish. As I have found out at home it’s easy to dry out swordfish on a grill, but they absolutely nailed this. I want to go hug the chef. That’s spinach and sunchokes accompanying my fish. Both worked well with the “sirloin steak of fish”. 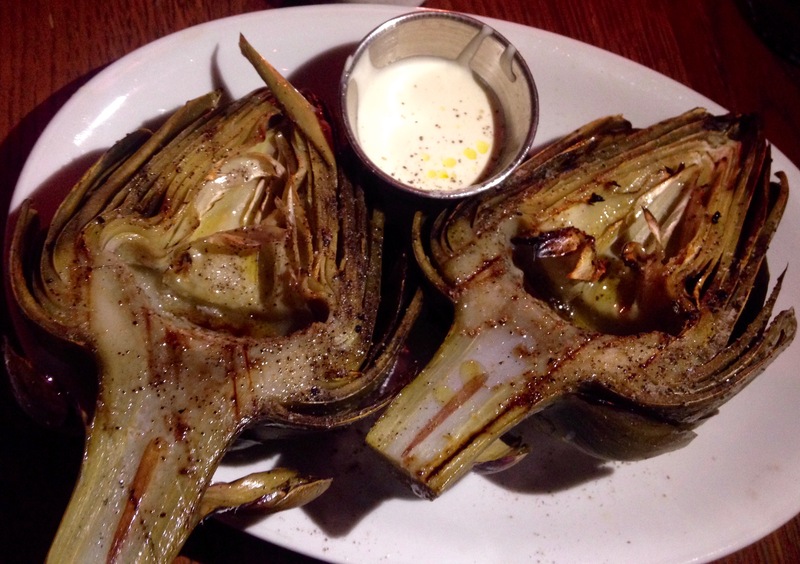 We order an artichoke for the table as an extra veggie. It looks good, but it’s our only miss tonight. It’s undercooked and a bit too hard. We could have skipped this one. 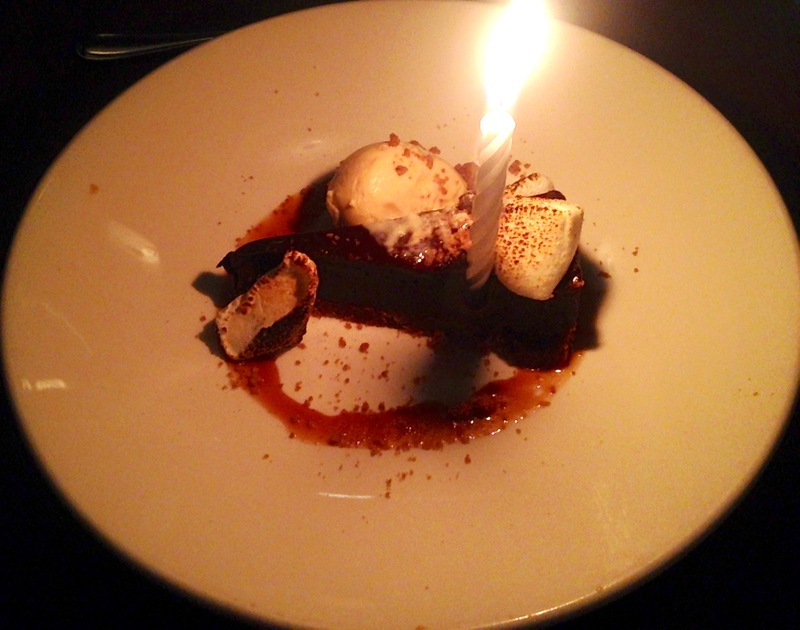 For dessert, we get a s’mores tart, a birthday candle, and three spoons. There’s marshmallow ice cream, marshmallows, chocolate and salted caramel. It’s a fun end to this very impressive meal. 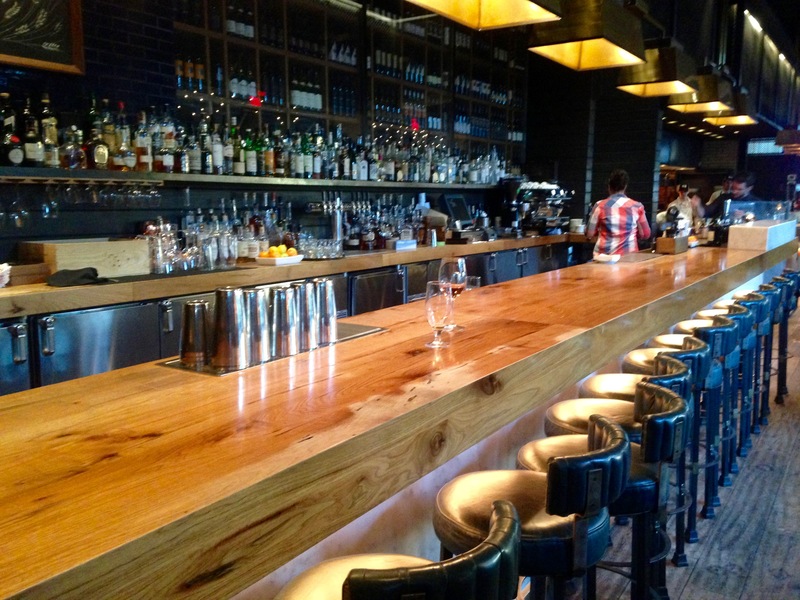 The bottom line on King+Duke: Worth going into Buckhead for, especially if you are celebrating a special occasion. I do want to try that chicken, and I wish we took a picture of it, but we thought it rude to photograph someone else’s food. As we are some of the last to find out, Ford Fry has another hit on his hands.